diego Diego is the new container runtime system for Cloud Foundry, replacing the DEAs and Health Manager. garden-runc Guardian is a simple single-host OCI container manager. It implements the Garden API which is used in Cloud Foundry. A typical stemcell contains a bare minimum OS skeleton with a few common utilities pre-installed, a BOSH Agent, and a few configuration files to securely configure the OS by default. For example: with vSphere, the official stemcell for Ubuntu Trusty is an approximately 500MB VMDK file. With AWS, official stemcells are published as AMIs that can be used in your AWS account. A release is the layer placed on top of a stemcell. A deployment is a collection of VMs, built from a stemcell, that has been populated with specific releases and disks that keep persistent data. These resources are created based on a manifest file in the IaaS and managed by the BOSH Director, a centralized management server. CF-Release is the BOSH release repository for the Cloud Foundry platform. To deploy Cloud Foundry, start with cf-release, build a custom manifest for your deployment, and let BOSH take over from there. Diego is the new container runtime system for Cloud Foundry, replacing the DEA (Droplet Execution Agent) and Health Manager. With the DEA architecture, the Cloud Controller schedules and manages applications on the DEA nodes. In the newer Diego architecture, Diego components replace the DEAs and the Health Manager (HM9000), and assume application scheduling and management responsibility from the Cloud Controller. From the standpoint of your application, here’s what you need to know: In Diego, you now have the choice to push a one-use function (a Task) or a more traditional application that stays resident (a Long-Running Process, or LRP) – a good example of an LRP might be a web server that you need always listening for traffic, while a Task may be something like a database migration as part of a release, or a task that examines recent data for something specific. Before, in DEA, you really only pushed processes that were expected to stay resident. Diego’s brain and health monitor makes sure these tasks are balanced as well as possible - spreading out CPU-intensive tasks across virtual machines, or balancing memory, et cetera. While before some of this was done as part of the cloud controller, now the Diego environment handles it itself. What isn’t handled by the BBS is handled by Consul - this is mostly locks to make sure only the right process is handling the right task (as an example in Diego, there can be only one Auctioneer at any time, but if that Auctioneer goes away, something else must pick up the lock) or load balancing. NATS Message Bus Bulletin Board System (BBS) and Consulthrough HTTP, HTTPS, and NATS Internal communication between components BBS stores most runtime data; Consul stores control data. A simple single-host OCI (Open Container Initiative) container manager. Gardeners Question Time (GQT): A venerable British radio programme. And also a test suite. Gardener: Orchestrates the other components. Implements the Cloud Foundry Garden API. Garden Shed: RootFS and volume management. Where stuff is kept in the garden. RunDMC: A tiny wrappper around RunC to manage a collection of RunC containers. Kawasaki: It’s an amazing networker. 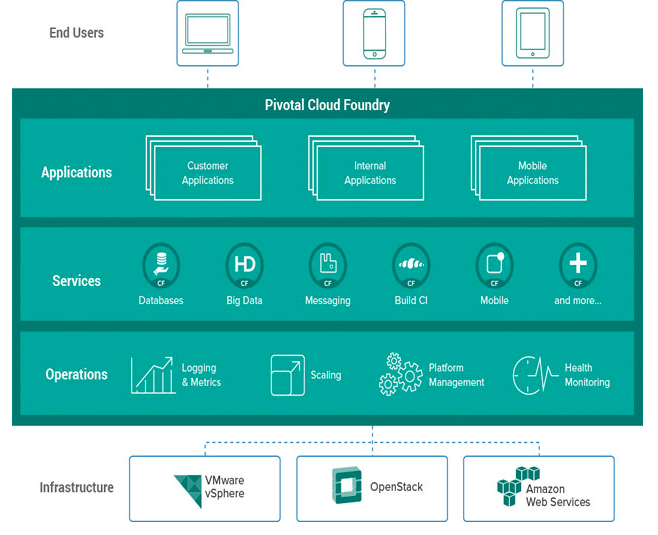 A lightweight Pivotal Cloud Foundry® (PCF) installation that runs on a single virtual machine (VM) on your workstation. PCF Dev is intended for application developers who want to develop and debug their applications locally on a PCF deployment.